Astronomers have used NASA’s Chandra X-ray Observatory to show that, multiple eruptions from a supermassive black hole over 50 million years have rearranged the cosmic landscape at the center of a group of galaxies. Scientists discovered this history of black hole eruptions by studying NGC 5813, a group of galaxies about 105 million light years from Earth. These Chandra observations are the longest ever obtained of a galaxy group, lasting for just over a week. The Chandra data are shown in this new composite image where the X-rays from Chandra (purple) have been combined with visible light data (red, green and blue). Galaxy groups are like their larger cousins, galaxy clusters, but instead of containing hundreds or even thousands of galaxies like clusters do, galaxy groups are typically comprised of 50 or fewer galaxies. 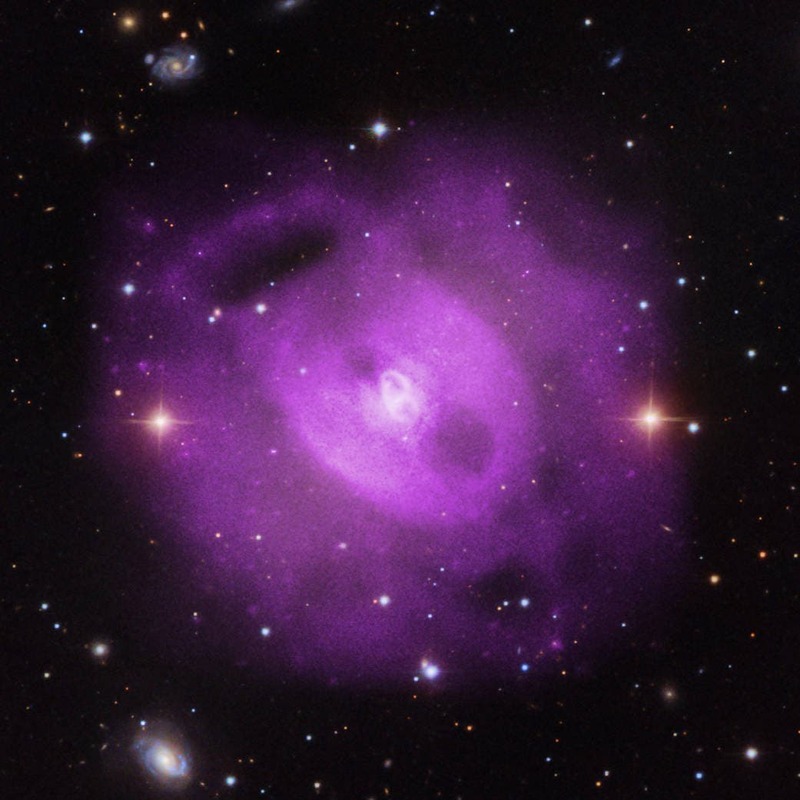 Like galaxy clusters, groups of galaxies are enveloped by giant amounts of hot gas that emit X-rays. The erupting supermassive black hole is located in the central galaxy of NGC 5813. The black hole’s spin, coupled with gas spiraling toward the black hole, can produce a rotating, tightly wound vertical tower of magnetic field that flings a large fraction of the inflowing gas away from the vicinity of the black hole in an energetic, high-speed jet. The researchers were able to determine the length of the black hole’s eruptions by studying cavities, or giant bubbles, in the multi-million degree gas in NGC 5813. These cavities are carved out when jets from the supermassive black hole generate shock waves that push the gas outward and create huge holes. The latest Chandra observations reveal a third pair of cavities in addition to two that were previously found in NGC 5813, representing three distinct eruptions from the central black hole. (Mouse over the image for annotations of the cavities.) This is the highest number of pairs of cavities ever discovered in either a group or a cluster of galaxies. Similar to how a low-density bubble of air will rise to the surface in water, the giant cavities in NGC 5813 become buoyant and move away from the black hole. To understand more about the black hole’s history of eruptions, the researchers studied the details of the three pairs of cavities. They found that the amount of energy required to create the pair of cavities closest to the black hole is lower than the energy that produced the older two pairs. However, the rate of energy production, or power, is about the same for all three pairs. This indicates that the eruption associated with the inner pair of cavities is still occurring. Each of the three pairs of cavities is associated with a shock front, visible as sharp edges in the X-ray image. These shock fronts, akin to sonic booms for a supersonic plane, heat the gas, preventing most of it from cooling and forming large numbers of new stars. Close study of the shock fronts reveals that they are actually slightly broadened, or blurred, rather than being very sharp. This may be caused by turbulence in the hot gas. Assuming this is the case, the authors found a turbulent velocity – that is, the average speed of random motions of the gas − of about 160,000 miles per hour (258,000 kilometers per hour). This is consistent with the predictions of theoretical models and estimates based on X-ray observations of the hot gas in other groups and clusters. Today's 'Galaxy' Insight –"Our Quantum Cosmos"